Sadly, the sidewalks of Java’s two largest cities, Jakarta and Surabaya, are lined with too many of these to count. 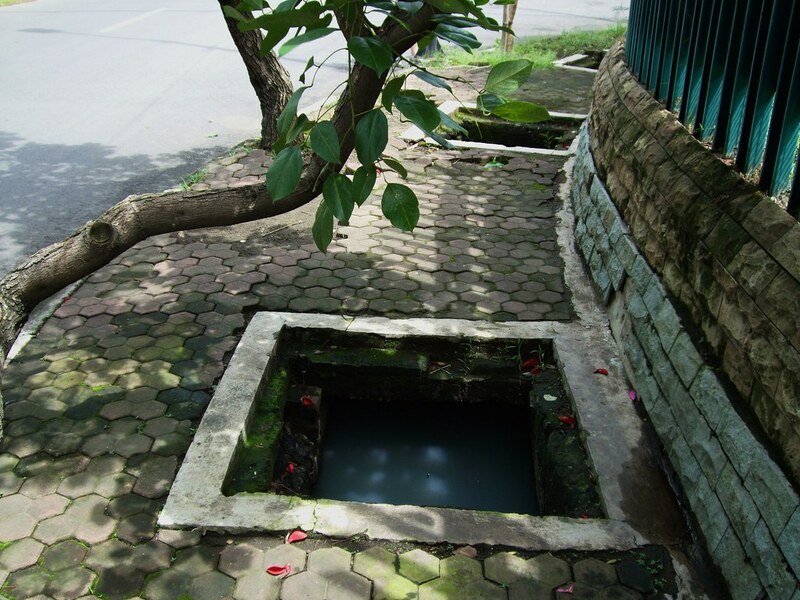 See for example the following image which shows the sidewalk you see above but from a different angle, illustrating the many obstacles you must avoid if you dare walk the streets of Indonesia. Jakarta is, by some accounts, the second most populated urban area in the world. This in itself wouldn’t render it an unmanageable city for tourists, but considering the lack of an underground subway and a mostly unnavigable public bus system, that’s basically what it amounts to. While the dilapidated sidewalks were less than welcoming, the real traps were actually encountered on our way to Gili Meno, the quietest of three islands off the north-west coast of Lombok. We took a taxi from nearby Senggigi Beach to Bangsal harbour, where we were planning to board the public boat bound for Gili Meno. Instead of bringing us all the way to the pier the driver dropped us off approximately 500 meters away. We were rushing to make the 10 AM boat so we hopped on a cimodo, a small hoarse-drawn cart. Unfortunately, the cimodo also neglected to bring us all the way to the ticket office and dropped us off conveniently at a travel agent’s office. As soon as he stopped a group of men approached us offering to bring us into their office where we could purchase a ticket for the boat. This seemed fair, but we knew that something was up. While we were waiting in the office one of the men went to check if the public boat had left or not. Meanwhile, this left another man to begin promoting various package deals, which we were of couse told were the lowest prices from the most honest travel experts in Lombok. By the time we got to asking about the public boat it had obviously left, and we were now trapped at the harbour until the next public boat left for Gili Meno at 2 PM. Since the public boat cost only $2 each, and to charter our own (exact same boat) would cost a total of $17, we were less than pleased and resolved to wait the 4hours to get on the cheap boat. After about half an hour of trying to negotiate a cheaper price for chartering a boat to the island, and looking at various trekking options with the travel agent, Geneviève and I decided to head to the official ticket office to check things out for ourselves. This was when the onslaught of hustling and touting came at us from every angle and in full force. Their tactics were crude, trying to make us feel guilty because they needed our business to feed their families and also making us feel stupid for wanting to take a public boat! They also purposefully deceived us, leading us to believe that once we would arrive on the island we’d be forced to pay even higher prices to get back to Lombok. We figured this was a trick to convince us to go with them (once we actually arrived on Meno our hunch was confirmed), and so I tried talking to the official ticket office. Unfortunately, we were followed by one of the touts who I’m quite sure intimidated the cashier into basically acting as if she didn’t speak enough English to answer my question. So, after nearly two hours of constant bombardment from the touts we did finally give in, just to get them off our backs. They won, we lost! Our skins weren’t thick enough. We just really wanted to get to paradise. On whether or not we found it, stay tuned for my next post. – Sidenote: Yes, touts are everywhere in South East Asia. You cannot avoid them. Are they annoying? Hell yes! But…and this is a major but…it is always crucial to remember that they are just trying to make a living, often in conditions which make it very difficult for them to do. Who could have thought paradise was so hard to get to! Yeah, it was a bit easier in Thailand wasn’t it? And cheaper! …oh how I miss the Woodland Lodge.